Although it’s impossible to fully plan out every aspect of childbirth and delivery, some preparation can enhance your labor experience whenever possible. Taking each step as a task to complete during your pregnancy can lead up to a mom that’s ready for whatever the labor process may throw her. Today’s moms have a lot more factors to consider that women 30 years ago didn’t. This can include the creation of a birth plan or even if family members can post pictures of the new baby on Facebook. Greater information and on what can make for an easier labor also means women have more control than ever over their personal comforts during childbirth. Exercise and pain management techniques can help a woman be more physically and mentally prepared for the labor process. This can also improve her postpartum recovery time. From choosing a OB/GYN to a pediatrician, making as many decisions as possible in the months leading up to the delivery day can take the stress off a mom, so that all she has to do when she goes into labor is grab her hospital bag and head to the hospital to welcome her new bundle of joy into the world. 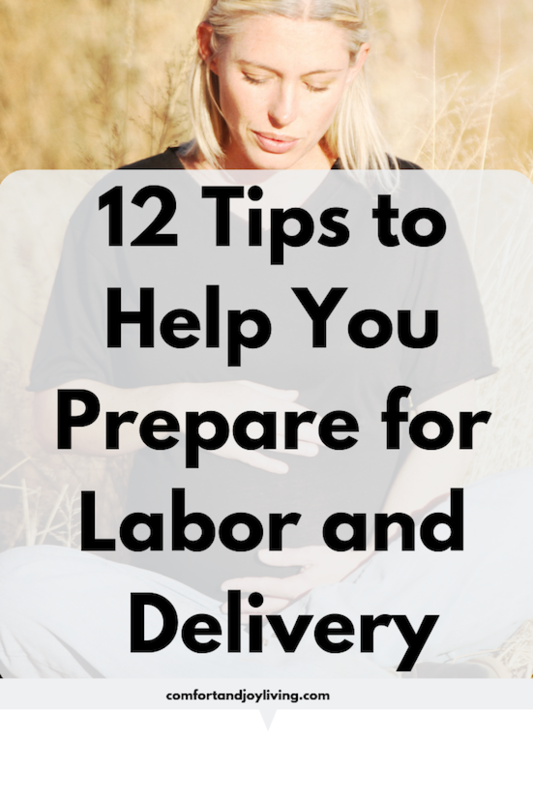 Here are 12 ways to help you prepare for a smooth labor and delivery. 1. Do things that you can to get ready. One of the most helpful things that you can do to prepare for labor and delivery is to have everything you can be ready. For example, pack your hospital bag early, set up the nursery, if you have family who are visiting from out of town, let them know when you want them to be there. Preparing at home as much as you can will help make it much more calmer when the time does come to leave for the hospital. You won’t have to rush around trying to pack your hospital bag or stress that you don’t have any diapers yet. You’ll be ready because you prepared for your baby’s arrival. 2. Do a test run to the hospital. This will help you see how long it takes you to get to the hospital and what the best route to get there is. That way, you’ll be comfortable and familiar with it when you go for the birth of your baby. If you live somewhere where there is rush hour traffic—or traffic in general, make sure you know when that is and if there’s an alternate route that you can take. It will be one less thing that you will have to worry abut when the time comes. 3. Take a hospital tour and preregister while you’re there. You’ll also know exactly where you need to go when you get to the hospital, and it will help you feel more comfortable with the rooms because you’ll have seen it before. It’s important to find the right healthcare and support personnel to help you through your pregnancy, labor and delivery. While most women use an OB-GYN as their main provider, you have other choices such as a family doctor or a nurse-midwife. Some women also use a doula in addition to their medical personnel. A doula can provide the emotional, physical and educational support needed to make your pregnancy, childbirth, and postpartum experiences less stressful. Don’t be afraid to talk with several medical professionals before deciding on one. After all, you’ll want someone that you feel comfortable with throughout your journey. 5. Know what to do when labor starts. You’ll want a firm plan in place about who to call, where to go, and when to leave. Your healthcare provider can give you a clear set of guidelines on what to do when you go into labor, like when to call and when to head for the hospital or birth center (or when to call your midwife if you’re planning a home birth). Decide who will accompany you and have a few back-ups just in case. Knowledge is power. Prepare yourself by learning about the different options for delivery and talk to your healthcare provider about your preferences, be it a natural birth, a water birth, a c-section, or otherwise. And take a childbirth class—or two. With our first child, my husband and I took a few classes at the hospital that were really helpful. You can take prenatal classes where you’ll learn what to expect during labor and delivery and the different methods that you can try to help you get through childbirth. Classes can definitely help you feel more prepared and stay calm during labor and delivery. 7. Talk to your healthcare provider about any concerns you have. This will help ease your mind and stay calm and prepare for labor and delivery. Your healthcare provider will have solutions to probably any concern that you have about childbirth. And you’re probably going to have them there during your delivery, so communicating and being on the same page with them is important. 8. Write a birth plan. A birth plan can address everything from what type of pain management you want to who you want in the delivery room with you. Think about the things that are important to you, write them up and share your plan with your partner, healthcare provider and other support. Everyone should be aligned on your birth plan and you should remain flexible as your team may need to make changes as necessary. 9. Study up on pain management techniques. Talk to your healthcare provider about pain management options. While some women prefer natural childbirth, others opt for pain management, such as an epidural or medication. It’s important to be as informed as possible in regards to these techniques so you can decide what is best for you. Speak with your healthcare provider to find out what is appropriate for you and what the hospital actually offers. 10. Prepare your body for labor. If you’re planning on having a natural birth, preparing your body for labor can help the delivery and recovery go much smoother. Practicing regular, low-impact exercise is not only integral to a healthy pregnancy, it gives you the strength and stamina that you need for childbirth. Plus, it helps reduce stress. Prenatal exercise, such as prenatal yoga can also reduce the pains and aches that occur during pregnancy and labor. Labor is as much a mental exertion as a physical one, so it can be beneficial to prepare yourself by practicing breathing and meditation Learning specific pain management techniques such as visualization and rhythmic breathing can help you manage, especially if you’re preparing for natural labor. Even if you aren’t planning on having a natural birth, it can help. First, it can help you breathe through the contractions before you are given an epidural. Second, if something does happen and you not able to get an epidural, you’ll know how to breathe through the pain and hopefully be able to stay more calm than you would if you didn’t practice. 12. Expect and accept the unexpected. Giving birth isn’t something that you can guarantee is going to go perfectly. It’s okay if you can’t stick to everything on your birth plan. Its okay if you have to have a C-section instead of a vaginal delivery. The most important things are your health and the health of your baby, and you have to accept that there are things that are out of your hands that you just can’t control. Just let go a bit and put your trust in the doctors and nurses that are taking care of you.